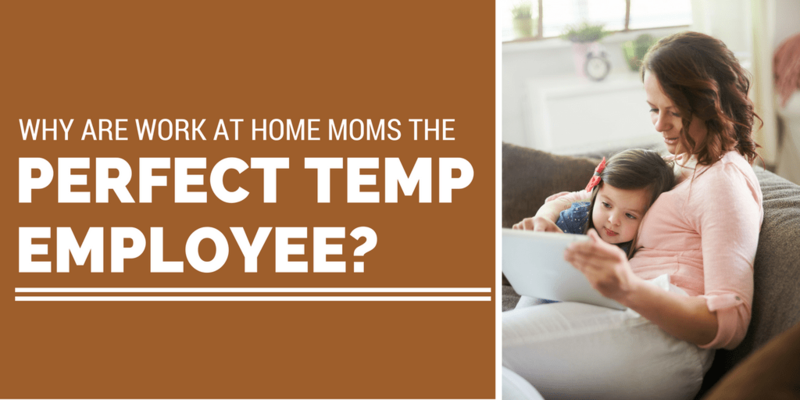 Work from Home Mom: The Perfect Temp Employee? Why Are Work from Home Moms The Perfect Temp Employee? Home » Latest from the Blog » Work from Home » Advice and More » Why Are Work from Home Moms The Perfect Temp Employee? Hiring moms to work from home might still seem like something of a daunting task to some companies. However, this is an increasingly popular way of getting the right employee in a way that suits everyone concerned. There are some big benefits that are associated with hiring work from home mothers that companies are now more aware of. After considering these advantages the idea should seem a whole lot more appealing to them and to you as a potential employee. A huge risk when hiring any new member of staff is in trying to find one that is going to be productive and highly motivated. This risk becomes even greater when you work from home and the boss can’t keep an eye on you throughout the day. However, studies have shown that home workers tend to find it easier to be highly motivated and productive. This may be partly due to a lack of distractions and partly due to the pleasure of being able to work in a way that suits them. When it comes to moms who are working from home, many ladies in this situation are delighted to get the chance to work on their terms while enjoying the sort of lifestyle they are after. This makes them incredibly keen to do a fantastic job and to carry on working in this way for as long as they can. Another tough thing to do is find all of the skills that are needed in just one employee. It may often be the case that the company has to compromise and hire someone that has only part of what they are looking for. Alternatively, hiring a temporary employee to work from home as a virtual receptionist or in some other role gives them the chance to look for the exact skills that they need for the current project or phase. They might keep going back and hiring you over and over again but this comes down entirely to their specific needs at the time. A good example comes with the case of hiring bilingual home workers to help out, as it often makes a lot more sense to hire someone who can handle their language tasks in this way. Find out here how you could use, for example, Dutch language skills to do a fantastic job. Work from home moms are typically women who offer a lot of experience and life skills to their employees. For a start, the fact that they are moms often means that they are used to having to be highly organized at all times and of having to multitask to get everything done on time. It may be the case that you have downscaled from a senior job in the past or it may simply be that you have gained a vast wealth of life skills over the years. Either way, a company can benefit from everything that you know. You might also find that you can do a lot more than you were originally hired for. If you are comfortable doing some other tasks, your boss could be pleasantly surprised to find that you are extremely capable of some many different things. One of the most impressive advantages of home workers is that they offer a lot of flexibility and convenience. Because you aren’t bound by normal office hours there is every chance that you can work at the times that suit you. There is also no time-consuming commute to eat into the day every single morning. In the best case scenario, they only need to call you or send you an email and you can start on your tasks right away no matter what time of day it is. If you haven’t yet discovered the numerous benefits to working as a work at home mother then perhaps now is the perfect time to do so and help a business grow in this way. Charles Dearing is a blogger and contributor to a big number of blogs. He enjoys writing about business and marketing and when he is not writing he loves traveling.